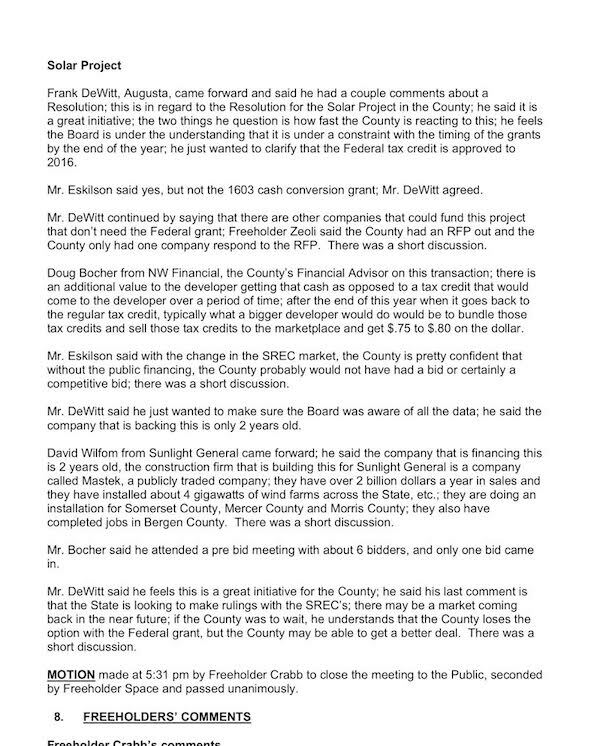 The Solar Project on the agenda for the Sussex County Freeholders on Oct. 26, 2011. Courtesy of the County of Sussex. SUSSEX COUNTY, NJ – The failed solar project has been making waves in Sussex County, not only among its residents, but in a political race. One candidate for assembly, Marie Bilik, has taken steps to bash both Assemblyman Parker Space and Freeholder Gail Phoebus along the way on social media and in letters to the editor…also running mates for assembly seats. In the meantime, NJInsideScene.com did an independent investigation into the accusations and deems the attack against Parker Space as groundless (and the attack against Phoebus as well, while we’re at it). Bilik accused Space of “leading the charge to go forward with the project.” Not true and political propaganda. Space and Phoebus in fact, asked for a U.S. Department of Justice investigation. The project, which was approved in 2011 and officials were told would be beneficial, has turned into a nightmare instead for three counties — Morris, Sussex and Somerset. And current freeholders who have spoken out against it have been slammed, including Phoebus, who was chastised for speaking her mind and calling out the company, Sunlight General, for its actions, and was threatened with a non-disparagement clause — which counsel has responded to on her behalf and said she is ready to take action. I agree with counsel that the attempt to silence Phoebus violates her First Amendment Rights, especially in a cause where our county has been left holding the bag to the tune of multimillions, for a project that has not been completed and where the companies have not made good on their word. The candidate against Phoebus (Bilik) accused her of potentially causing more legal issues for speaking her mind. Phoebus has every legal and constitutional right to speak out on behalf of the people against a company that has defaulted on a public project. If our legislators are being silenced, who is going to speak on our behalf? (and by the way, the last time I checked, “We the People” are not gagged from speaking out about this…especially when truth backs it…and as this is an “opinion piece” that has fact, I have every right to speak out about this issue, and launch my own independent investigation into it and the side issues emerging with the false claims from the political adversary). Back to the false commentary against Space. The adversary claimed he was the one who met with Morris County officials on the project and “led the charge” in the effort to puff up the greatness of the solar project. Again, not true. The proof is in the pudding below. 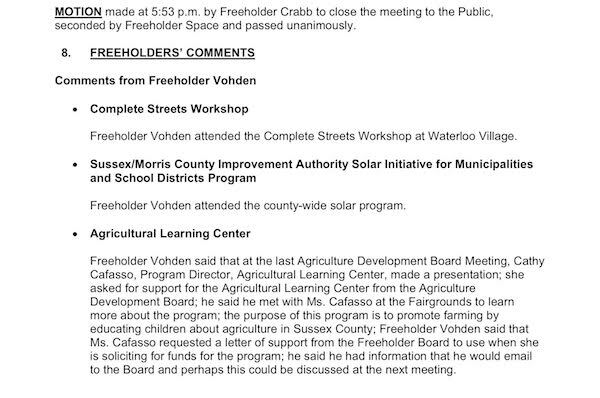 Comments from Freeholder Richard Vohden about the solar project on April 13, 2011, and attending a solar program meeting. Image courtesy of the Sussex County Board of Chosen Freeholders minutes. 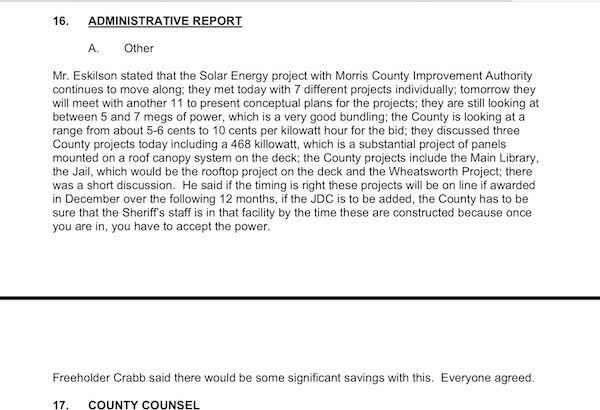 Comments from Freeholder Phil Crabb about the solar project on April 13, 2011, and attending a solar program meeting. Image courtesy of the Sussex County Board of Chosen Freeholders minutes. Note: At this same meeting, Space makes no mention of anything about the solar project, or having even attended the meeting…making this accusation that has come his way baseless. 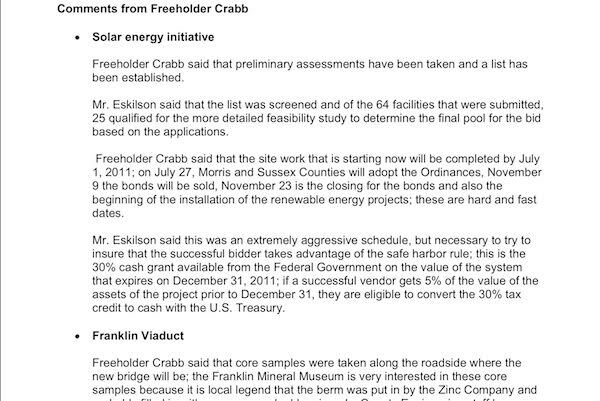 Two of the members of the freeholder board, however, did their “due diligence” into this project, and brought it back to Space and the other freeholders. Space, on April 13, 2011, instead reported on county tourism and having attended a DARE Graduation in Newton. Sussex County Meeting Minutes from May 11, 2011. Image courtesy of the Sussex County Freeholders Board. Additionally, Sussex County Administrator John Eskilson kicks in commentary about the topic, discussing the feasibility study and noting the aggressive schedule for the project. Again, if one delves into the meeting minutes, it is noted that Space does not say a word about solar, and instead, speaks about a walkthrough of a new charter school and of attending an Advanced Housing event. On June 22, 2011, again, this issue is addressed again, with Eskilson and Crabb the only voices speaking about it. 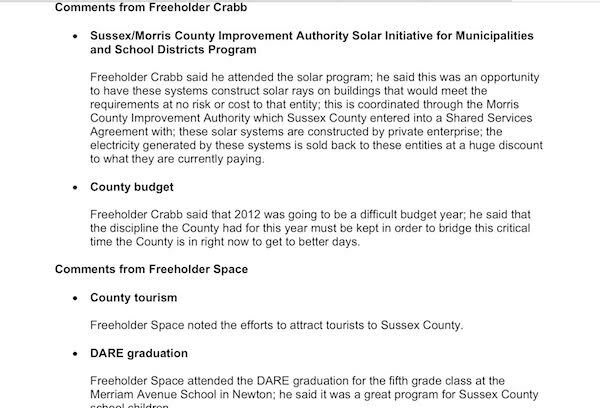 Comments about the Sussex County Solar Energy Project, with John Eskilson and Phil Crabb speaking on the topic, on June 22, 2011. The comments from Freeholder (now Assemblyman) Space that day only related to farming, and the importance of continuing to keep the interest fostered. Bilik has also attacked Space for seconding the motion to approve it. From someone who has attended council meetings regularly (me), the first and second are random efforts from members of the council/board, to get the motion going to approve or disapprove. “MOTION made at 5:31 pm by Freeholder Crabb to close the meeting to the public.” There were five voices that could have started and seconded this motion. There were two voices on this board, however, who had shown they had attended the meetings and took a somewhat active role, plus the administrator. And Parker Space, the record shows, was not among that group. The final discussion about the solar project before the vote on Oct. 26, 2011. Image courtesy of the County of Sussex. 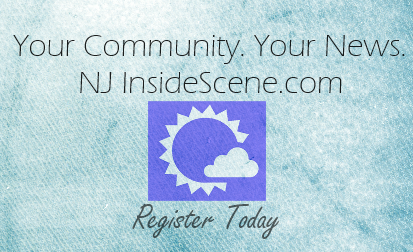 Stay on the scene, with NJInsideScene.com, as we continue to follow this, and many other stories of interest from around the area. Click here to follow us on Facebook.